July 20, 2012 By Katie P.
I started researching Thomas Aspery a couple weeks ago, from the list I made of possible relatives (see previous post). He had the same uncommon last name, was born in England, same generation as Catherine, and lived in Sharon, PA. They must have been related! First, I ordered a couple obituaries for Thomas. 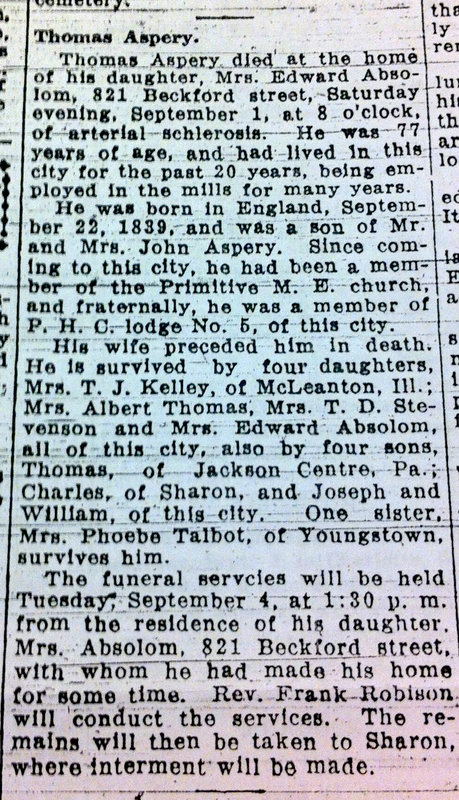 This one lists a father named John Aspery and a sister, Phoebe Talbot of Youngstown. Luckily, Phoebe Talbot was not a very common name combination, so it was pretty easy to find her death certificate on familysearch.org. The father is listed as Henry Aspery, not John as Thomas’ obituary said. Both records are secondary though… maybe the father’s name was “John Henry?” Another possible issue is Phoebe’s birth year of 1861, making her 22 years younger than brother Thomas. Either way, the mother’s name is extra helpful: Sarah Perchase. I began searching England census records for a Sarah, married to either a John or Henry, with children Thomas and Phoebe (and maybe my Catherine!). One census record was particularly promising. Here we have Sarah with husband Henry and children Thomas, Phoebe, and a Catherine! The grandson named “John Henry” fits with my theory about the father’s name. Thomas’ age is only slightly off from his obituary, but Phoebe’s is about 8 years off her death certificate age and if this is my Catherine, her age is off by 9 years compared to the 1900 US census. I found Phoebe in 4 more census records, all of which were consistent with the birth year of about 1853 (within 2 years), so it’s likely the informant on her death certificate just didn’t know exactly. At this point, I decided that the Thomas and Phoebe in the US is the same Thomas and Phoebe in England, and that they were children of (John) Henry Aspery and Sarah Perchase. But that still left the question, is this “my” Catherine? I have been researching Matthew Talbot, husband of Phoebe Aspery, and have their marriage certificate. I also have other Aspery census returns. I would be very happy to hear from you. Phoebe and Kate’s (Catherine’s) mother was called Pritchard. Kate was born in West Bromwich, Staffordshire, where they lived before the family moved to the North East of England. William Murphy was Irish. Phoebe was my great grandfather’s 2nd wife and he left behind a young daughter (my grandma) from his 1st marriage when they went to Pennsylvania.Her mother died in childbirth. My gran never heard from him but was told by someone that he had been killed. I am very interested to know more. I was brought up in the vicinity of the village in England where they lived. My son has also sent an email. Hello! This is very exciting and it’s a family line that I never thought I would know much about. I will email you both! Phoebe Aspery (Talbot), born in Escomb, England, and daughter of Henry Aspery, was my great-great-grandfather’s second wife, and the sister of Catherine Aspery who was married in 1870 to William Murphy. Matthew Talbot (Phoebe Aspery’s husband) left England around 1883, it is said, to seek work when industry declined sharply, and according to family information he became a manager of a steelworks in Pennsylvania; he lodged with Mr Will Murphy on arrival in the USA. My great grandmother, born 1880 (by Matthew Talbot’s first marriage to Ellen Elgey, who’d died in 1882 before he married Phoebe) enquired about Matthew Talbot via Irish relatives in England who’d known the Murphys, via a letter in 1913; and she heard he’d been killed at work in an industrial accident. (He’d left England when she was 2 and she was brought up by another family). My mother says this webpage with your research is the most exciting thing she’s seen in 30 years of extensive research on her family, and she has a lot more information about the Asperys and Talbots, a bit about Murphys too, and their background in England. I’m sure she’d be happy to share her research with you. I gather she’s posted a comment too. I am a descendant of Thomas Aspery mentioned in the above post as the brother of Phoebe Talbot of Youngstown, OH. Thomas’s daughter Elizabeth Aspery Thomas is my mother’s grandmother. Thomas Aspery and his wife Martha Newbold Aspery are buried in the Oakwood Cemetery in Sharon PA. There are no markers but two of their children Henry Aspery and William Aspery have markers in the same plot. I went to the library in Youngstown OH last month and got a copy of Phoebe Talbot’s obituary in the paper on 30 Nov 1921. There is no mention of a husband but that she was staying with her daughter Mrs. Carl B Wenfeck of Youngstown at the time of her death and was to be buried at Belmont Park Cemetery. Her death certificate shows that Mrs Carl (it may be Cora) B Wenfecker was the informant . Do any of you know anything about this daughter, like her first name, her maiden name, who her father was, when she was born, died or buried? I have searched for the name Wenfeck and Wenfecker and have come up empty. I have a lot of information that I have on Thomas’s family that I am willing to share as well. I did a bit of research today, online. Phoebe Talbot’s Death Certificate, dated 29th November 1921, includes the information that she was widowed; that her husband’s name was ‘Mathey Talbot’; her occupation is given as ‘housewife’ and her address, Sharon Line Stop, Coitsville, Mahoney, Ohio. Her date of birth is given as 14th October 1861, her birthplace ‘England’, and her parents’ names are given as ‘Henry Aspersy’, and ‘Sarah Perchase’, both from England. Records also reveal that children were born to Phoebe and Matthew Talbot. George Henry, a glazier by trade, was born in 1892, and married Martha Wilson in Venango, PA in 1915 but sadly died the following year in Youngstown; and Sarah Talbot, born in Pennsylvania, appears on the 1920 US census, aged 30, in Mahoning, Ohio; she is living with Phoebe Talbot (whose age is inflated on the record by some four years to 65). As a ‘daughter’ living in the household Sarah is described as ‘widowed’, but has nonetheless resumed her maiden name of Talbot. (We aren’t informed what her late husband’s name was). Both her parents are described as being originally from England. Also in residence is a sixteen-year-old called Alice McCormick. Quite when and how Phoebe Talbot was widowed still remains a mystery, but records reveal that a ‘Mathias Talbot’ died in Cuyahoga, Cleveland, Ohio, in 1895, aged 43, which would be the correct age (we know Matthew Talbot was born in Barrow, England in 1852). Regrettably, there is no supporting detail whatever about background or family on this record, and thus it seems a little obsure, and his name is slightly different too. I’d very much like to find out for sure: I wonder whether there is any way of discovering more about the information passed down that an industrial accident ended Matthew Talbot’s life? My mother was an Aspery and I’ve done a great deal of research into the English side of the family tree. Phoebe Talbot was indeed born (on 14 October 1852) as Phoebe Aspery, the twelfth child of Henry Aspery and Sarah Purchas, at Escomb, County Durham, where her parents had moved in 1846 or 1847, when the iron works opened. Henry had been an ironworker in Wolverhampton and, before that, in Eardington, Shropshire. He was born in Hollinswood, Shropshire, sometime between 1803 and 1812 (the records are very muddled). Her marriage to Henry Jordan is confirmed by a marriage certificate. 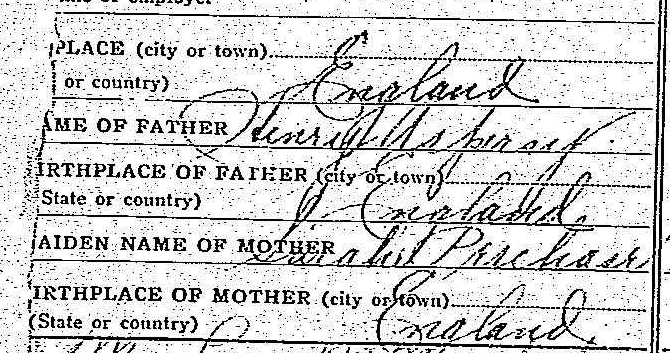 Phoebe was unable to write (marriage certificate and birth certificate of Nehemiah Jordan). Phoebe Aspery also married Matthew Talbot in 1883 at Auckland Register Office. She is described as Phoebe Aspery, Spinster, on the marriage certificate, despite her previous marriage to Henry Jordan. Henry Jordan was still living at the time of Phoebe Aspery’s second marriage. I hope this is helpful. I’m fascinated by what I’ve read here and will follow up my researches in England with a good look at the American branch of the family. 3 x Great Grandson of Henry Aspery (who, incidentally, had 51 grandchildren and, by the time my generation arrived, must have achieved many hundreds of 3 x Great Grandchildren). … and, yes, you’ve identified the right Catherine. I’m the great granddaughter of Matthew Talbot and his 1st wife Margaret Elgey. They had a daughter who was described as ‘1 day old’ on the 1881 census. Margaret died in childbirth and my grandma became known as Margaret Ellen Talbot. She never really knew her father as he married Phoebe and left for America. I don’t think my gran ever knew he had remarried as her grandmother Ellen Elgey wouldn’t talk about him. She tried to locate him at the turn of the century but discovered Matthew had died. I’m sure Phoebe was still married to her 1st husband when she married Matthew. Do you have any American census records which include Matthew or his children by Phoebe? I would very much appreciate hearing more if you have. Phoebe Talbot was my great great grandfather Thomas Aspery’s sister. She was named as his sister from Youngstown OH when he died about 1917. The death certificates I have confirm that as well. I have done quite a bit of research on Phoebe and have the names and birth information of all the children of Matthew and Phoebe and I believe spouses and children. I will be glad to share what I know with you. I think I have some evidence somewhere that Matthew was killed in an industrial accident in Youngstown about 1895. I am not sure of the dates. I will try to find you all the information I have gathered and post it her soon if you like or send it to you by email. Margaret – You ask if I have any American census records which include Matthew or his children by Phoebe. I assume Alice was the daughter of Sarah Talbot, who appears to be unmarried (although she is described as a widow). There is also a record of an unnamed female child, surname McCormick, born in Cleveland, Ohio, on 5 Jan 1903, parents James McCormick & Sarah J Talbot. This could easily be Alice McCormick – which suggests that, if Sarah Talbot was born in 1890 (as the census record suggests), she was only 12 or 13 when her daughter was born. Even the census record puts a difference of 14 years between the ages of Sarah and Alice. Thanks for getting in touch. Bob Ralph has been sending me entries which follow Phoebe’s movements and I now have a good idea of when Matthew died. He died in 1895 in Cleveland, Ohio from typhoid. One of his sons, George Henry Talbot also died of typhoid in 1916. Another son, Matthew survived. Matthew and Phoebe’s daughter Sarah was born in 1885 so there is a discrepancy somewhere. I’ve seen the 1920 census which gives Sarah’s age as 30. Perhaps a later census with Sarah and her 2nd husband Carl Wenfecker would confirm her date birth as 1885. Bob found the pair on a passenger list where both give their ages as 27 and 28. The ship was the Egypt and date 1883 which tallies with what my grandmother believed. I would like to find any living descendants. They must be out there somewhere. I hope you are making great progress with your tree. You may also be interested in this record. It’s a link to the transcription of some of the marriage records of St Peter’s Collegiate Church, Wolverhampton. Hidden in there is the record of the marriage of Henry Asbury and Sarah Purchas on 25 October 1830. Thanks for all the information. I have since found most of the census records, but I’m so excited to see the marriage record. I would have never found that! I did find and order the marriage record for Catherine and William, but searching and ordering from another country was a bit confusing. Glad to connect with a distant relative from England! Thanks for replying so promptly. I was in touch with Katie a couple of years ago and at the time we did not have a date for Matthew Talbot’s death. I am eager to know when and how he died. The only two census records that I have been able to find on Phoebe Talbot are the 1920 census in Mahoning Co OH and the 1900 Census in Cleveland OH. I also found her in the Youngtown OH City directory in 1916 and 1917 saying that she was a widow of Matthew and living with her son Matthew. The 1900 Census may be a key for finding out when and where Matthew passed. She was living at the same address as John and Matilda Aspery at 1946 Axtell St in Cuyahoga County OH Cleveland Ward 25 District 0130 on page 49 of the 1900 census. The head of the household was George Greene and his wife Elizabeth Greene. The three stepchildren of the head were George Talbert (b Sept 1891), Sarah Talbert (b Sep 1885), and Matthew Talbert (b Jul 1889). I believe that Matthew had died sometime before and Phoebe was using her middle name Elizabeth and had married Mr Greene in 1898. The children’s last names were spelled Talbert instead of Talbot (a very common mistake). I suspect that she was living at the same address as her brother John Aspery after Matthew had passed and married George Greene and either divorced him or he died and she returned her name to Phoebe Talbot by the time she was living in Youngstown. I really don’t know how to show those documents here, so I have described them to you here as best as I can. I can email you the documents as well as the descendants reports I have for Matthew. I believe that Matthew died before 1898 based on this evidence. Thanks so much for getting the photo of Phoebe’s headstone! Here’s the link, if anyone wants to take a look: http://www.findagrave.com/cgi-bin/fg.cgi?page=gr&GRid=96452089. Too bad there isn’t any other info on her there. Bob, I will transfer you over her findagrave page – I need to transfer most of my findagrave pages to people who are more diligent about maintaining them! I will gladly maintain Phoebe’s findagrave site. I visited there this summer and saw the roster. Her son George Talbot who died in 1916 from typhoid is buried in an unmarked grave in the same plot as well as George’s infant daughter who died in 1917. The others buried in the plot are named Griffiths. If anyone knows the relationship of the Griffiths to the Talbots I would surely like to know. They may be related to George’s wife Martha Wilson Talbot.